What is it about Fins and boats? 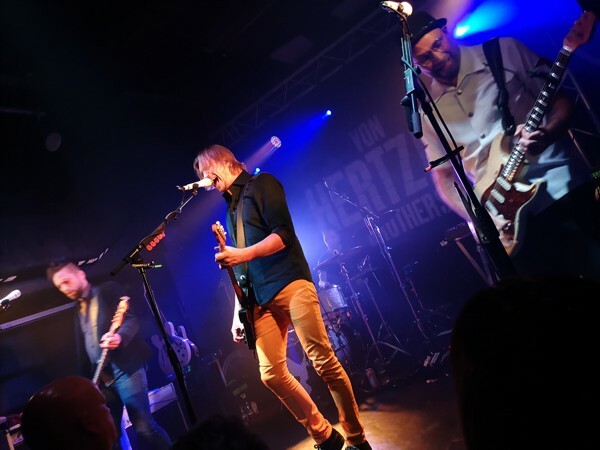 As much as I was surprised to see the Von Hertzen Brothers playing this water-based venue, if their videos are anything to go by, they should feel right at home onboard the Thekla! First up though, were Novatines, a Bath-based four piece (Jamie Beale – lead vocals/guitar, Tom Cory – lead guitar, Callum Moloney – drums, Tom Turner – bass) who dished out a familiar brand of heavy Rock 'n' Roll, performed with no little confidence and a modern edge. Confidence above their station, one might think, but a run of well-delivered melody-laden, Classic Rock tracks won over the gathered throng, and entitled the band to what turned out to be a successful audience sing-a-long. With strong vocals and a good stage presence, Novatines have dropped anchor firmly in the "ones to watch" category. 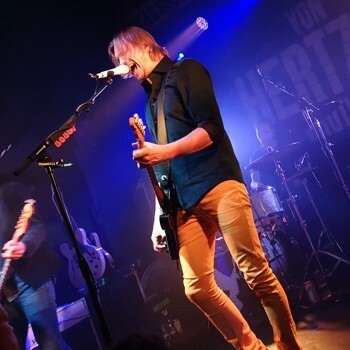 The Von Hertzen Brothers were on the second UK leg of their 'War Is Over' tour. The first leg brought them to The Fleece a year ago (just around the corner), but if this evening's gig appeared to be a step down in terms of venue size, there was no hint of this in the band's humour, energy levels or commitment. What a difference a year makes... to younger brother Jonne and elder brother Kie, anyway. 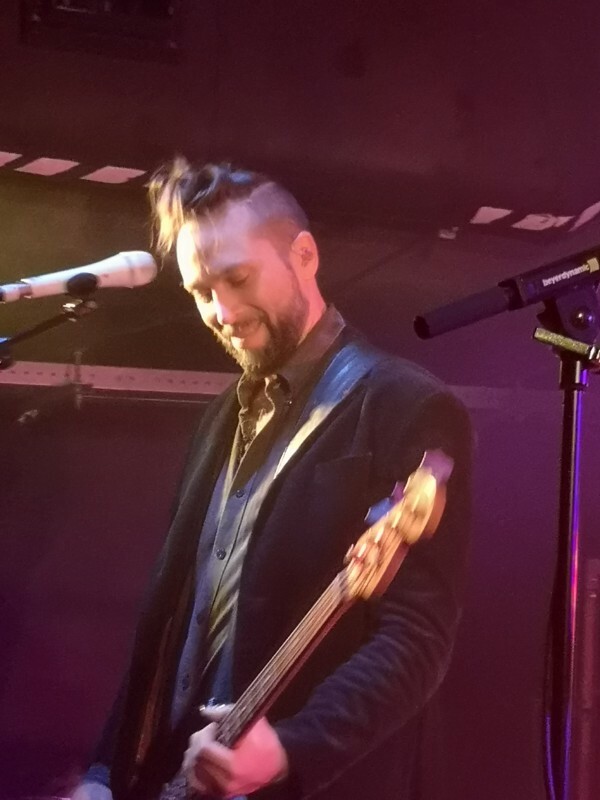 With his smart shirt and jacket and a side-shaved pineapple top pony tail hairstyle, Jonne is transformed in appearance, now looking like a weird cross between a bass God and a catalogue model. Meanwhile, Kie has thrown off the wizened philosopher look, shaving off most of his beard and looking rejuvenated in his white top and bowler hat. Some things, however, remain the same. 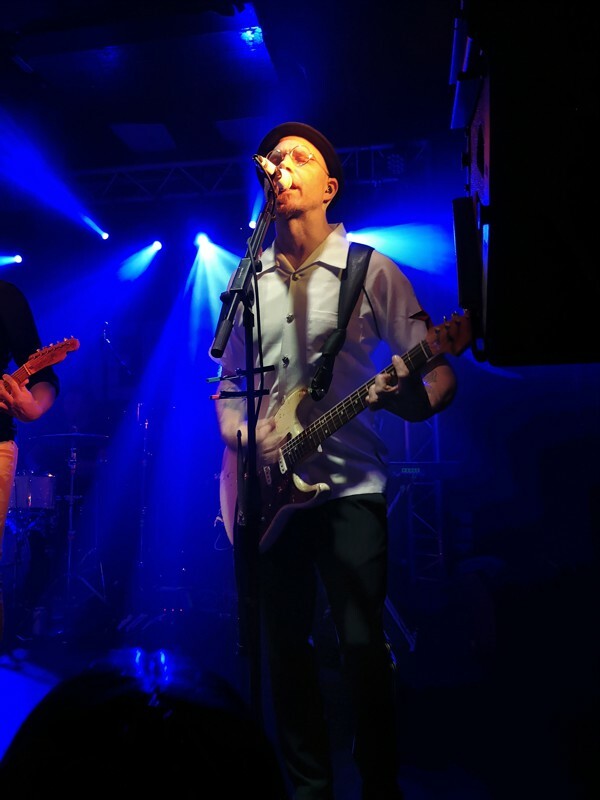 The music sounds as fresh as the proverbial daisy, as the Brothers – with a typically robust Mikko in fine form at the helm - romped their way through a well-chosen high-octane, hard rocking set. All flowers, no rust, as they stretched the ship's sound system to the max, and garnered a fanatical response from those present. As on the first leg, they opened with the lengthy 'War Is Over', backing themselves again to hold their audience's attention and succeeding with ease. A forceful rendition of 'The Arsonist' followed, and one couldn't help but admire the band's optimism and resilience. We barely had time to draw breath before they launched into 'Jerusalem', a track set to be released as a video single to mark the 70th anniversary of the Declaration of Human Rights. In a similar lyrical vein, 'Freedom Fighter' (from 'Love Remains The Same') was the first departure from the current album and was typically, blissfully raucous. Amidst the chaos, I was particularly taken with Robert Engstrand's quirky keyboard fills. As on the first leg, the touring line-up was completed by drummer Sami Kuoppamӓki, who maintained astonishing energy levels throughout. A stomping version of 'Miracle' (from the excellent 'Stars Aligned' album) was slightly (though only slightly) marred by some brief feedback issues, before the surprise (for me) inclusion of 'Blindsight' – the Jonne-penned track from 'War Is Over' that was omitted from last year's set. Kie provided additional percussion, storing his drumstick in his mouth when he needed both hands for his guitar! His madcap antics are always a feature of a strong VHB performance and this evening he had clearly left his valium in the crew's quarters. Buoyed by praise of their recent Planet Rockstock performance, the band fair raced through the ultra-catchy 'Long Lost Sailor' - always a highlight for me, and most appropriate given our location. Land Ho! "We are also known for being a bit proggy" said Mikko as the band slowed things down just a touch with the classic 'Kiss A Wish' (from the 'Approach' album). They break it down and build it back up again perfectly - a stunning demonstration, as if it were needed, of their musical chops. 'Sunday Child' provided the now customary audience participation. Mikko asked us to improve on last year's Fleece performance and was not disappointed as the audience really went for it. The live version of this track has transformed my appreciation of it. Tonight, as always, it was engaging and all-enveloping. 'Coming Home' saw Kie taking lead vocals. It's frantic, quirky and quintessentially VHB, and another of tonight's highlights. Prog anthem 'Flowers And Rust' followed, performed with a heavier feel without losing any of its pathos. A powerful and utterly compelling version of 'New Day Rising' brought the set to a close, and I was struck, once more, by the strength and consistency of both material and performance. Only the very best bands can sustain this level of excellence. Encore 'Let Thy Will Be Done' provided no let up in this respect and was well-received by a well-informed crowd. It was a full-throttle, no holds barred show from the off and no one left disappointed. Small venues like this are great for the converted, the loyal fans who still like to get up close and personal with the band. But, really, the Von Hertzen Brothers ought to be playing large concert halls everywhere by now, not just in their native Finland. Frankly, I don't know what else they have to do! Tonight they were magnificent, giving everything at what, by their own standards, was a relatively small gig. For those present, it was an immersive experience from start to finish (no pun intended.) Just superb.